On Meeting a Strawberry in Japan | This Japanese Life. Posted on July 24, 2013	by E.
Before I came to Japan, I told myself that this was a bit of practice for dying. It wasn’t the most upbeat assessment of moving abroad, but it rang true. I was about to end my life, or at least, I was about to take a practice round for facing the real challenge, when that once uncountable expanse of unspent days becomes a precious commodity. I left for Japan to practice losing my ties to things. While a punching bag doesn’t prepare you for a street fight, and target practice doesn’t prepare you for war, we might hope that practice makes it more familiar, and easier to face the real struggle when it comes. With some maudlin exceptions, everything living seems to prefer it to dying. The battle I’ve had with my ego while abroad has humbled me about that final interview with eternity. I liked who I was in America. I liked my friends and family, my job, my stuff. I liked me. But I initiated the rituals of departure: the countdown of the-last-time-I’ll-do-its, final goodbyes before a solitary, tear-filled taxi ride as the sun rose over Logan airport. People told me they’d never do what I was doing because they’d be too sad. Crying seems like a bad reason to avoid something, but boy, humans sure do a lot to avoid it. I always feel sad about goodbyes, perhaps because of the practice rule: The sadness of a goodbye is practice for all future goodbyes and all final sadnesses, and who wants to think about that? When you are a healthy sad about the ending of something, you connect to the ending of everything. In Japan, my identity decomposed into new soil. I struggled to hold on to what I was. Panic attacks and anxiety were warnings that my identity – the one I liked, the one I was quite fond of, the one that spent years figuring out how to get what it wanted – was being replaced by a new set of adaptations that were radically changing who I was. I wasn’t losing my mind, I was losing my ego. The ego, in the Buddhist sense, is the part of your inner dialogue that makes it all about you. It isn’t arrogant, per se, just preoccupied with itself. Some people walk into a room and feel like everyone’s been waiting for them, some people walk into a room and feel like everyone is criticizing them. The ego is the thing that tells you that anyone is noticing you at all. As the guardian of my shifting selfhood, my ego was anxious. It placed extraordinary value on the position of my “identity,” a pebble mistaken for a boulder submerged into rushing waters. I wanted the water to divert itself around a pebble, but water always wins. I walked through a cave in Yamaguchi recently, stones full of holes caused by tiny drops of water from the ceiling, accumulated over thousands of years. Nothing is impenetrable. This is my last week in Japan. I am moving away from a stream that whittled me down, smoothed out my edges. I spent time here fighting a process that made me, in the end, more sane, simple, tolerant and yielding. My ego hasn’t shut up. It’s still there, starting sentences with “Me / My / I” and using words like “deserve” and “should,” the fighting words of a toddler, the battle cry of everything bitter. “My coworkers should help me with moving,” it says. “My employer should be paying the costs of closing this apartment.” All completely unreasonable, really — and all about me, me, me. The “I/Me/Mine” stream has its uses, because hey, I have to survive. I’m no monk. I’m trying to approach my ego as an advice columnist and not my superior officer. What seemed to happen, in my last weeks in Japan, is that rather than feeling a sense of attachment and a longing to stay, I have left already. Some students gave me flowers. They’re plastic so I don’t have to water them. It’s a nice gesture, but lately I feel like those plastic flowers, being there and looking the part but not really living. What a bore. The ego troll spent two years complaining about all the injustices it had to endure, and now that we’re leaving, it’s acting like it was no big deal. The inner troll doesn’t want to feel myself leaving, because I’d be reduced to a bubbling puddle of tears. It doesn’t want me to feel that healthy sadness of a goodbye. Saying goodbye to anything is saying goodbye to everything. It’s terrified of letting go, terrified of anything that doesn’t have itself at the center. I should probably cry or something, but I’m on perpetual guard duty, distancing myself instead. Nonetheless, I’ve found myself scrunching up my face in bed at night, giving myself a headache to stave off tears. It’s not like anyone can even see me. I just really hate crying. Friends who have left Japan give me the impression that the country eventually slips away into a hallucinatory blur, like grainy film footage that gets worn down when you replay it. Internal movies, bubbling from the heat of internal projection, losing focus, filled with the stories you tell instead of the things that happened. I believe this, because memory isn’t real. Without the “permanent” backbone of memories – the buildings, the faces of people, the train routes and the daily kanji practice that create a concrete reminder of the past experiences inside a building, with those faces or flashcards – there’s nothing to hang those memories on. Photographs, journals: Water rushes over everything. The life beyond the Instagram border. Memory is just the polite word for imagination. You start photocopying the photocopy of a bad drawing you never actually made. I’d like to soak up all the realness of the world while I’m in it, but I can’t. 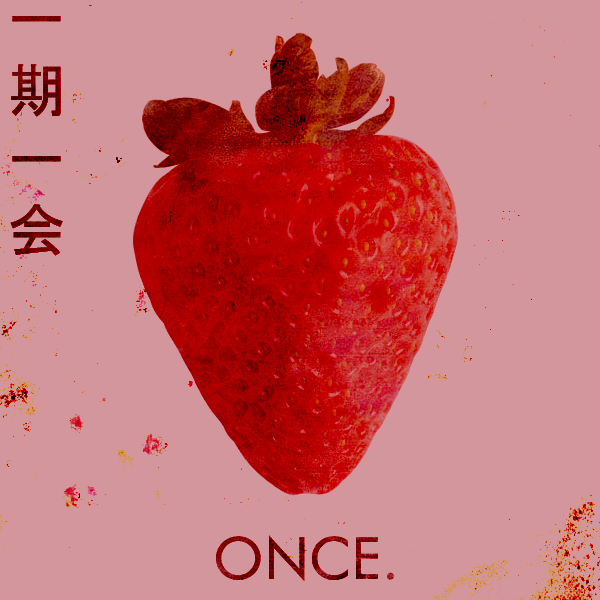 For a long time I loved the phrase ichi-go ichi-e because I thought it meant “meeting a strawberry.” Literally, it is “one life, one meeting,” the meeting being a person or a challenge, or, as I like to think, meeting one strawberry. Ichi-go ichi-e is best understood if we retroactively apply it to the bushido days, when a warrior would train with as much intensity as a real battle. If he fell off his horse and injured his arm, he would get back on the horse, carrying on instead of restarting, because he does not believe in the idea of “trying again.” Each move should be completed as if it were his only chance. He would imagine practice as if it were real life, or else it wasn’t really practice, just play-acting. When things were hard, I would tell myself, “this is practice” as a way of separating myself from the pain of real emotions. The correct technique, perhaps, is to feel those experiences completely, to let the tears flow, to live through it without going numb. To practice feeling things fully, instead of practicing detachment. You will never do anything “again.” You only eat one strawberry, even when you are eating a bucket of strawberries. I should practice remembering that, practice experiencing my life fully while it is happening. Meeting the Strawberry, rather than eating one after the other. Everything is practice, nothing is practice. We prepare for the real thing by living it. is only a world of dew. This might be your last chance to follow This Japanese Life on Facebook. This entry was posted in Homesickness, Preparations and tagged expats, japan. Bookmark the permalink. “The correct technique, perhaps, is to feel those experiences completely, to let the tears flow, to live through it without going numb. To practice feeling things fully, instead of practicing detachment.” we’ll said. That’s exactly what I decided to do some years back, and my writing took a huge step forward as a result. There were other benefits but I couldn’t have asked for more than that. Living in japan, I think man people go numb and practice detachment as a way of making life in japan more palatable. And it works. But then,in the numbing, they’ve also numbed themselves to many aspects of life essential for maturity. The sentence that Locohama quoted sums it all up. Feel everything fully, live through it. “Here and now”, the mynah birds used to say in “The Island” by Huxley – a very Buddhist idea. Possibly your best, most heartfelt piece yet. Or maybe I’m just projecting…. I started reading your blog when I started a new job, about two years ago. Most mornings I would skim my RSS reader over coffee but I was always careful never to miss an entry from you. I just wanted to say, thank you for sharing your unfiltered experiences. They often give me a useful perspective from which to reflect on my own issues. Intermittent psychological barometer. Leaving is always sentimental; but while the country may change, the engine powering you will only be more robust for the experience. In a weird way, I feel compelled to try something new, too. Ichi-go ichi-e, I’m going to take this post to heart, thank you. This post was really beautiful. For me, it felt like each sentence was a small but bright explosion of wisdom in an infinite darkness. I am not sure I understood all of them, but the poetry of your words makes the meaning almost irrelevant. Thank you for the immense inspiration you’ve bestowed upon me. Beautifully written reflections, I much appreciated them. You know, this is quite normal. I don’t know how much you’ve lived abroad, but for me that is one way of coping because no stay is permanent. It’s like you ‘check out’ before you actually go as it mitigates the leave-taking. There’s nothing wrong with it, although it’s not always good (I sometimes ‘check out’ months before, meaning I’ll get lazy about making new friends because I’ll soon be moving, or lazy about attending events, because they don’t matter, etc.). But you also have to be conscious of it, because, indeed, you do need to live the moment, regardless of the fact that you might be leaving tomorrow. By the way, as I understand you are headed to London next, which is where I’m based (at the moment – not permanently, of course). Give me a shout if you want to reconnect to Japan, say, by watching a Japanese movie or something. The human mind loathes transience, which is odd, considering how change and the impermanence of all things is basically the fundamental building block of the universe. I do think the mind can be trained to suffer less in the face of loss, but it never really gets easier. I cried when I left Japan, and I’ll probably cry about it again. That’s a defense mechanism and a pretty normal reaction to having been through tribulations that have sewn you to a place, common feelings of expats in many places, I think, or anyone who’s had to grow a lot in a certain period of time or place. I felt similarly upon leaving Taiwan. I deffinatelly have to go to Japan !!! When I first got to Japan I also felt like I had died. I realized that my “personality,” or at least my ability to express it, was largely conditional upon a culture that was no longer around to back me up. I had to let go of feeling competent. Reading your blog was helpful. Thanks for your honesty, and I look forward to reading about your next adventures!! I especially love that Haiku!